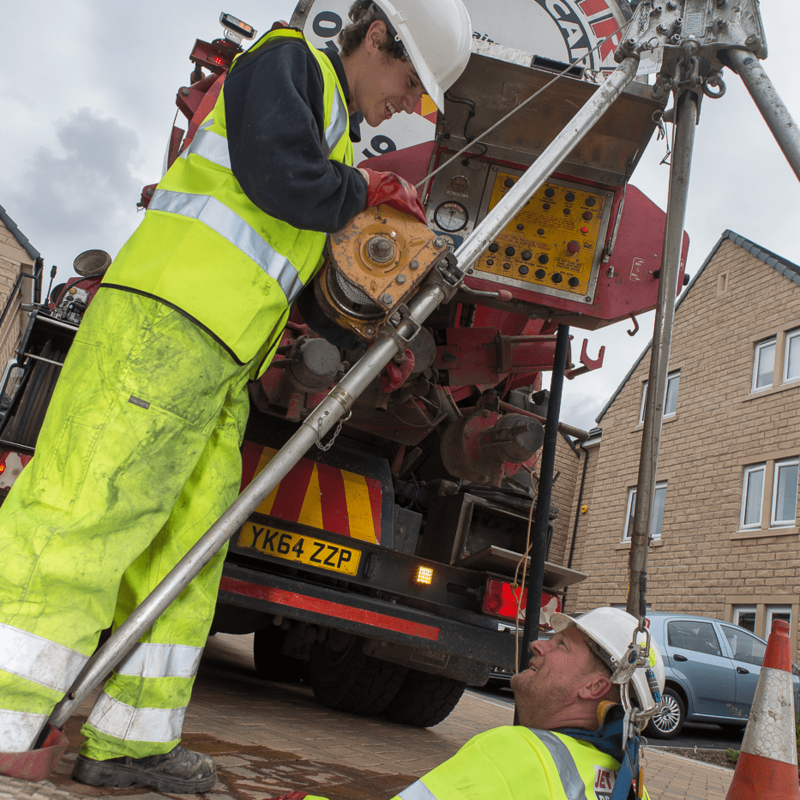 Jet Aire can provide a comprehensive drainage service to all commercial customers across Leeds, Yorkshire and the North of England. 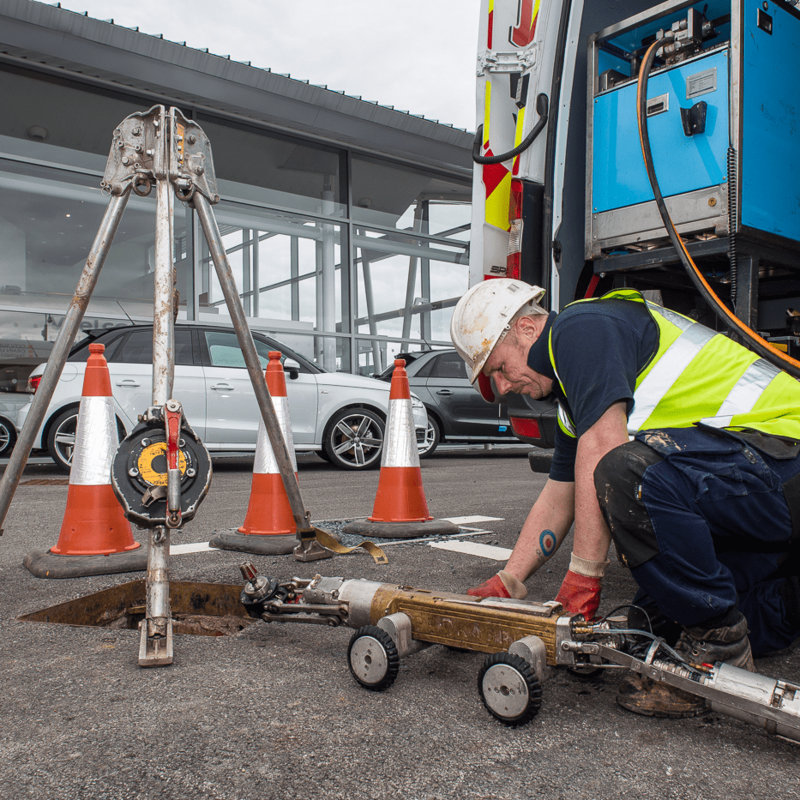 Should a CCTV Survey show that there are issues with a drain run, these can be resolved with either a patch repair, sewer lining or traditional excavation. Patch repairs are used when there is localised damage. 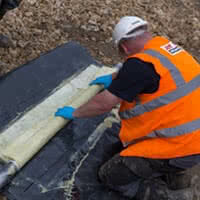 The patch consists of a length of glass fibre matting, which is coated in resin. To install the patch, the matting is rolled around a “packer”, which is then pulled through the pipe run, until it is situated at the correct place. The packer has an airline connected to it, so when it has been placed correctly, the packer is inflated, forcing the patch to adhere to the pipe wall. Once the patch has cured, the packer is deflated and removed, leaving the patch in situ. Sewer lining is used when the issues with the drain run are too numerous to install localised patches, or it is more cost effective to use a liner, either through cost or time. Sewer lining can be installed and cured using either an ambient, hot or ultra violet curing method. 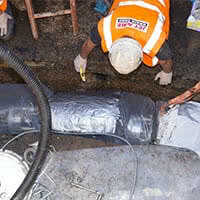 A resin-impregnated liner is inserted in to the pipe and pulled through to the next manhole. The liner is filled with water, which is heated to around 85 degrees. The water is circulated for 4 hours until the liner is cured in place. The water is allowed to cool, the liner is cut to release the water so that the liner can be trimmed and any lateral connections cut. 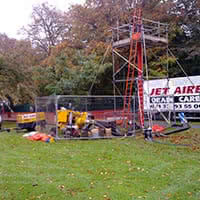 A resin-impregnated liner is cut to length and installed using a compressor and an inversion drum. This method is quick and is ideal for managing existing flows and can be done from one access point. The liner, which has been impregnated with light sensitive resin, is pulled through the run and is inflated with air. A UV light train is then pulled through the run. Once the light has come into contact with sewer lining, it begins to cure, this is a faster option, although it is restricted to straight runs. A liner is used when the issues with the drain run are too numerous to install localised patches, or it is more cost effective to use a sewer liner, either through cost or time. Liners can be installed and cured using either an ambient, hot or ultra violet curing method. Patch repairs are used when there is localised damage. The patch consists of a length of glass fibre matting, which is coated in resin. To install the patch, the matting is rolled around a “packer”, which is then pulled through the pipe run, until it is situated at the correct place. The packer has an airline connected to it, so when it has been placed correctly, the packer is inflated, forcing the patch to adhere to the pipe wall. Once the patch has cured, the packer is deflated and removed, leaving the patch in situ. The sewer liner, which has been impregnated with light sensitive resin, is pulled through the run and is inflated with air. A specialist UV light train is then pulled back through the run, via a winch, the speed of which is controlled by a computer, based on the diameter of the pipe. Once the light has come into contact with the liner, it immediately starts to cure, so it is a much faster option, although it is restricted to straight runs. 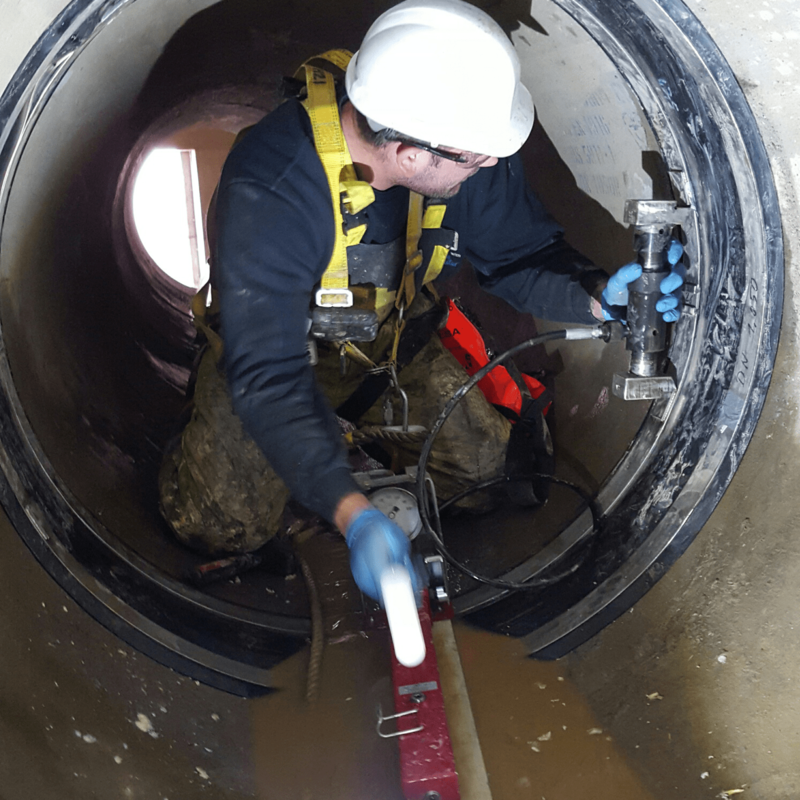 Confined space entry is employed when an operative has to enter a manhole or chamber. The operative is lowered into the said manhole or chamber via a winch that is supported on a tripod or specialist arm, by a colleague. The opertaive will be connected to the winch via a harness and will have a gas detector attached to his clothing. The latter will monitor basic harmful gases, so should an alarm sound, his colleague will winch him out of the manhole or chamber. The Ultracoat system, a structural epoxy spray coating application, can be used on a wide range of substrates, providing rehabilitation and structural reinforcement. It is commonly used in the chemical and food & drink sector because of its high resistance to the effluent that travels across it and because it has a wide range of chemical resistance. Designed by Danny Warren, the system has had zero failures in the last 35 years. Chambers and tanks often have a residual film of product on the side walls and floor. To remove this build up, ultra high pressure water jetting or shot blasting is employed. 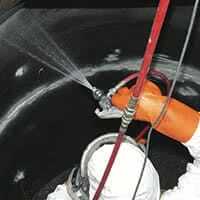 Jet Aire operatives are trained in both and use either method when cleaning substrates. On the rare occasion that a liner or patch cannot be installed, due to the diameter of the pipe, a specialist seal will be installed, which takes the form of an industrial rubber band that is secured at either side with metal bands that are stretched hydraulically, with shims inserted until the bands are at their optimum limit. Robotic cutters are used to open any laterals that are covered up when a liner or patch is installed. In addition, they are employed when there is an item in a drain run that cannot be removed using tradition high pressure water jetting attachments. Tree roots can often be found in drains and if the root penetrates a drain, then it is highly likely a blockage will occur as the roots will block the drain by trapping solid matter and this can have major implications for your business. Jet Aire can provide a variety of methods that will remove any root intrusion without damaging the pipe and eliminating expensive excavation. We are fully equipped with the latest hydraulic root cutting equipment that will quickly and effectively remove the root intrusion in the short term.